Examples, videos, worksheets, stories and solutions to help Grade 8 students learn how to solve absolute value equations. In this lesson, we will learn how to solve equations with absolute value. The following diagram shows how to solve an absolute value equation. Scroll down the page for more examples and solutions. 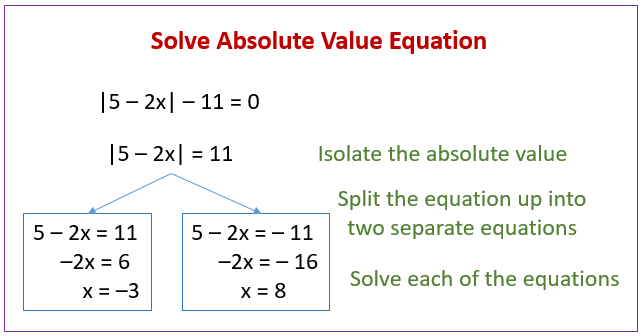 In this lesson, we learn that when solving an absolute value equation, the first step is to isolate the absolute value. The next step is to split the equation up into two separate equations (one positive and the other negative). Finally, the last step is to solve each of the remaining equations. In math, absolute value equations are best solved by isolating the absolute value portion from the rest of the equation. Find out why the lowest number on the opposite side of an absolute value equation should be zero with help from a math teacher in this free video series on math help and lessons. How to Solve Multi-Step Equations with Absolute Values? In math, the absolute value of a number is its distance from zero. Solve absolute value equations with tips from a math teacher in this free video on solving math problems.